You can see right through this Disney Traditions Ice Bright Mickey Mouse Illuminated Statue by Jim Shore… and it lights up! 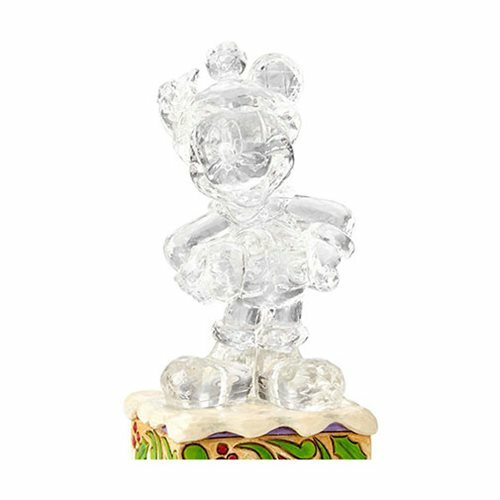 Nothing captures the enchanting feel of Christmas quite like an ice sculpture, and Jim Shore taps into that wonder and whimsy with this distinctive Mickey Mouse figurine, intricately handcrafted and hand painted to look as though it were carved from ice. Folk art-inspired holly leaves are etched into the platform base for a colorful touch of holiday cheer. Don't worry. This crystalline design won't melt before your eyes, because it's sculpted from high-quality clear resin, polyresin, and calcium carbonate for a lifetime of love. Measuring about 4 9/10-inches tall x 2 1/2-inches wide x 2 1/4-inches long, it requires 3x "LR44" batteries, included. It's a great companion piece to the Disney Traditions Ice Bright Minnie Mouse Illuminated Statue by Jim Shore (sold separately).